Wizard Rides 346; 347, 348, & 349: Did We Miss Anything? After work, I rode Wizard in the indoor arena with the hackamore again. He was a little snarly and pinned his ears a few times- definitely less cheerful than he was for his last few rides, but nothing alarming. We did basic walk/trot work, changing directions pretty often to keep him focused. The vet came to the barn to do Wizard’s spring shots and we also did an under-saddle evaluation of his issues. She could not detect any lameness per se, but did see him do his kicking and ear pinning routine. It was a relief to have a professional watching us and evaluating us. She was pleased with his overall condition, and said I have been very kind to him in my process-of-elimination method of figuring out his issues. She also liked the way his saddle fit (yay!). Her recommendation for our next step is to 1) block his feet and try him under saddle again, followed by 2) tranq’ing him and scoping for ulcers, followed by 3) injecting his SI joint. The appointment is scheduled for Monday, April 9. Cross your fingers. I took Wizard out on a trail ride with Kris and Sunny. Throughout the entire ride, he was quick and tense. We did the shorter loop, and when we hit the intersection where we could go home or keep riding, he blew a little fuse and did some leaping and misbehaving. He threw a little tantrum. I sat as quietly as I could, scolded him verbally when he resisted the bit, and then he settled back down a little for the rest of the ride. 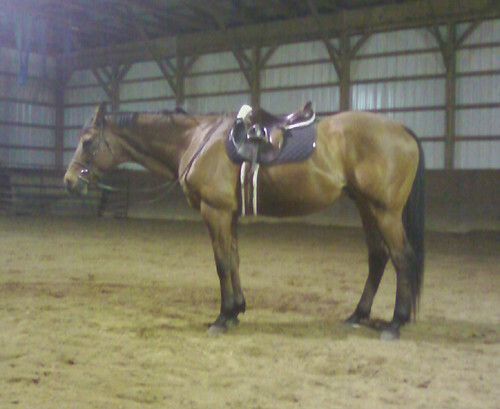 When we arrived at the barn, I did ringwork with him in the dressage arena. He was better in the arena than he was on the trails, so we did some canter work. His canter was bunchy and tense. He picked up the wrong lead a few times and only changed in front when I asked for a flying change. After our ride, I groomed him and let him enjoy some spring grass. Wizard was MUCH better today. We basically repeated our ride from Friday, but did the trail loop in the other direction (I love being able to take the loops in both directions). Wizard happily walked the entire ride, and did not throw a fit when we rode through his least favorite intersection. We returned to the barn and did flatwork again in the dressage ring. His left lead canter was actually kinda decent. He stretched onto the bit and I was able to give him his head a little. The right lead was rough- he kept throwing his haunches to the inside and threw an uncomfortable buck. I hesitate to call it a buck, since it’s not exactly a naughty-horse=type buck. It’s more like a horse who is not sure what to do with his body. He was very willing and honest throughout the ride, and we got some nice trot lengthenings. Some of the other lengthenings were a little surly, but nothing too bad. I gave him a bath and let him graze with his friend Sunny again. Ahhhh, springtime. Ollie’s vet was out and I mentioned his sore hips… we checked his hocks – no prob and she mentioned his SI joint! The one thing she kept mentioning was if he had a problem going forward and we definitely don’t have that problem. But I’m going to look into it further. He really only acts sore when someone is on his back. He’s always great moving during ground work sessions. The vet is coming back on Wednesday to finish up our spring shots and we’ll be talking more about it. I may have him injected..
Geez, these two were separated at birth! There are several really helpful threads on COTH about experiences with the injections. Best of luck and keep me posted!